I believe this is the team from 61/62. A lot of us also appear in the rugby photo. Mr Lawton managed us and commented at one time that Norton and Taylor were his goal machines. 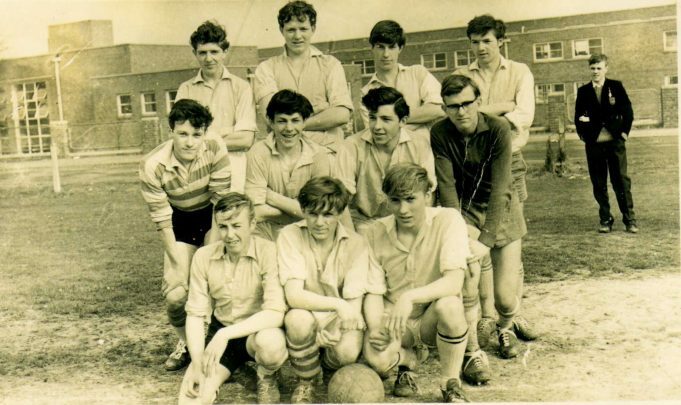 I played golf against Mr Lawton at Boyce Hill a few years ago in a Seniors match Boyce v his club and after recognising him and reminding him of all the football history, we had a round filled with ‘remember that school match’ etc. but despite that it didn’t stop him beating me. I let him win really!! I don’t know who is in the background of the photo. Names come up all the time when we meet up and you and Kenny have been mentioned, so if you want to meet up with the others when we have a drink at the Zac pub, contact the web site and they can send me a message. I married Pete Shaw in 1973 we have 2 children and was married for 42 years. Pete suffered with MS for 32 years and sadly died on 14.03.2015. I was speaking with my friend Ken Lammas, to remind me that he played for this side because he was a brilliant Inside Right and a prolific goal scorer. He said he played alongside Bruce Tyrie and is surprised that he isn’t mentioned. Ultimately he played for Thundersley and Hadleigh in the Southend and District League in their first team. Perhaps Mr D could be consulted. PS Ken said the football pitch was down in the bottom of the school field until the field opposite the school started to be used for Rugby! !